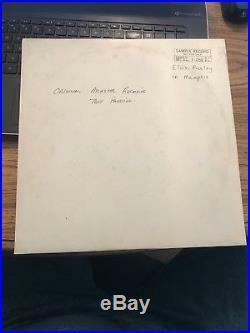 Very Rare original master recording test pressing of Elvis Presley in Memphis. On the top right corner there is a sticker that says Sample Record Not For Sale Record NO. 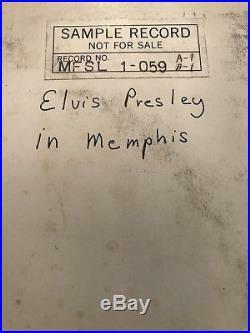 MFSL 1-059 A-1 B-1" Then written in ink it says "Elvis Presley in Memphis under the sticker. 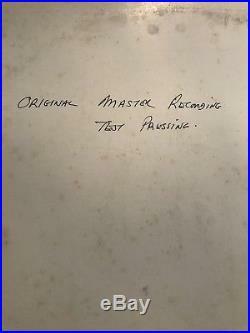 Then in the center of the jacket in ink it is written "Original Master Recording Test Pressing". 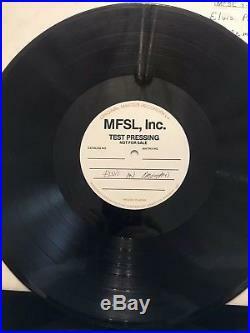 On the album the disk label says ORIGINAL MASTER RECORDING MFSL, Inc. TEST PRESSING NOT FOR SALE" Then written in ink it says "Elvis in Memphis" Then under that it says "PRESSED IN JAPAN MANUFACTURED BY VICTOR COMPANY OF JAPAN. LTD FOR MFSL, INC The album is in near mint condition. The jacket has some minor color issues but is in excellent condition with no tears or damage to it. 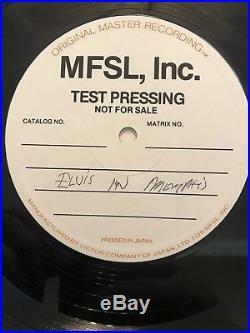 The item "Very, Very Rare Elvis Presley Original Master Recording Test Pressing. Only One" is in sale since Tuesday, May 8, 2018. This item is in the category "Music\Records". The seller is "scottdoyal" and is located in Vacaville, California.